Another spin for Ulster down to the RDS, another journey home that must have felt like twice the distance. They hadn't travelled in expectation against a Leinster side on the cusp of an interpro clean sweep, rather in the hope of keeping things respectable. They hope to announce an overseas replacement for Christian Leali'ifano in the next few days. Depending on his quality that might bring them some cheer. This result didn't actually set a new record - the 37-3 scoreline in 1908 remains the biggest margin in Leinster's favour - but neither did it leave much room for argument. 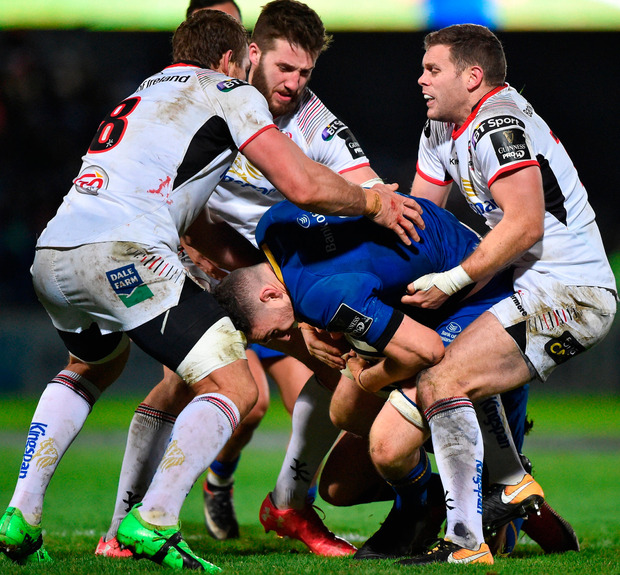 Against as strong a side as Ulster could put out in the circumstances, Leinster, despite having made 13 changes from last weekend, were on a different level. As for Joe Schmidt, form aside, his concerns these days are over who he has to pick from for the Six Nations. So the sight of Garry Ringrose being helped off with an ankle injury in the second half wasn't too encouraging. Nor indeed was the non-appearance for the second half of Tadhg Furlong, who failed a HIA at half-time. James Tracy was also a casualty with an elbow injury that looked to be causing him a bit of grief. Six tries - all scored behind the scrum and five of them by the back three - to one was a fair enough reflection of what had happened. For the crowd of 17,373 on a bitterly cold, but dry, night it was a good way to start the New Year. As they were reflecting on it afterwards some might have concluded that being so far ahead of the other provinces is not as good as it seems, but that won't get much support when the tries are being re-run and analysed. With two of them going to the irrepressible man of the match Jordan Larmour, it's fair to say he'll get most of the attention. From set-play he is dangerous; from broken-play he's lethal. And when his defensive game catches up with his attacking prowess, he will walk on to the Ireland side. Well, run more likely. "Yeah, he's already made the step up to Champions Cup level so it'll make for interesting selections next week," Leo Cullen said. "He's a very, very exciting talent for sure, very versatile. He's one of those players who's just incredibly talented." He was part of a Leinster backline that man to man looked more dangerous than their opponents - and given that Charles Piutau was at 15 for Ulster that illustrates the gulf. Robbie Henshaw was very good, while up front Leinster were far hungrier. "I thought the guys brought really good intensity and there was more consistency to that intensity than last week, or the week before against Munster as well, so that was probably the most pleasing part," Cullen said. "And generally we took our chances pretty well - maybe left a couple out there but it was great to see backs running from distance. The players looked sharp and that was probably the most pleasing part of it." At times in the first half you wondered if the sparse Ulster attendance - their smallest following for this fixture in memory - suspected there was a force-field working against their players once they crossed the half-way line. Only late in the game did that situation change, by which stage Leinster were out of sight. Typically a move would start with promise and they might get through two phases, and into a decent position, only to turn the ball over. It was at the cost of a penalty then moments later they would be standing at a lineout in their own half watching Leinster take control. And the home team were a good deal better at building momentum. 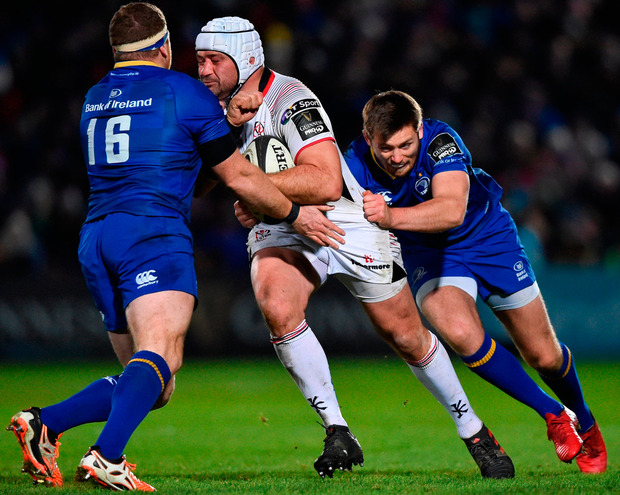 Both sides were 100 per cent at the set-piece in the first half - Ulster's scrum was the best it has looked in a while - so it was all about accuracy in filling in the bits thereafter. The difference perhaps was the speed at which Leinster were able to move through the gears without losing control. 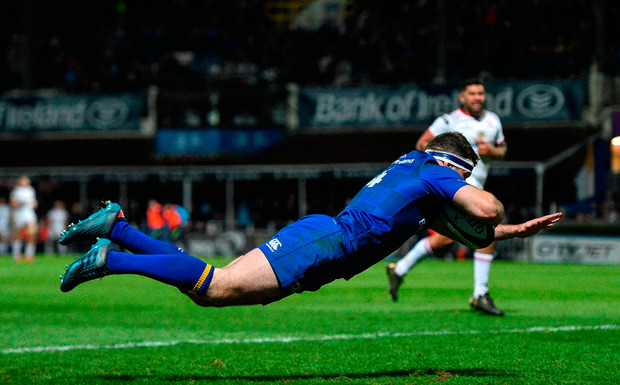 It was 12-0 at half-time after Larmour and Barry Daly scored, and then Leinster motored away in the third quarter with Fergus McFadden - having a whale of a time of it these days - getting over twice in four minutes, by the end of which the home side were 26-0 ahead with a bonus point banked. Thereafter, it was about filling their boots, which, despite Jacob Stockdale's try, they kept doing until the final whistle. Europe is the next target. And Leinster are in great nick. Scorers - Leinster: Larmour, McFadden 2 tries each, Sexton try, con, Daly try; Byrne 3 cons. Ulster: Stockdale try; Cooney con. 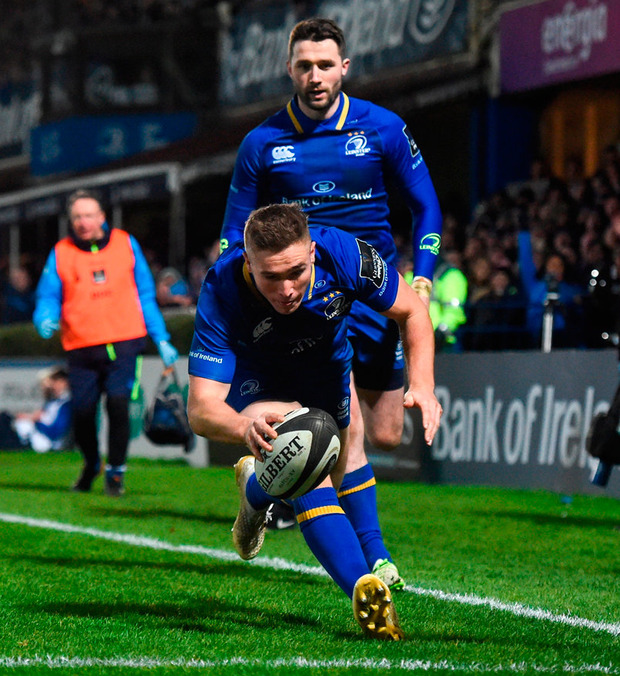 Leinster: J Larmour; F McFadden, G Ringrose (N Reid 59), R Henshaw, B Daly; R Byrne (J Sexton 57), J Gibson-Park (N McCarthy 66); J McGrath (capt) (E Byrne 57), J Tracy (S Cronin 27), T Furlong (A Porter ht), D Toner (M Kearney 66), S Fardy, J Murphy, J Conan (M Deegan 61), J Murphy.